Joanie and Chachi. Ricky and Lucy. Ross and Rachel. Sam and Diane. These are all couples that have stood the test of fictional TV time and forever made every man and woman use these relationships as standards in their own life. SEE ALSO: Remember Lisa Foiles from 'All That'? Just wait until you see what she's up to now! However, one of our favorites was from the hit NBC comedy, "The Office." Jim Halpert (John Krasinski), and Pam Beesley (Jenna Fischer) were the dream. 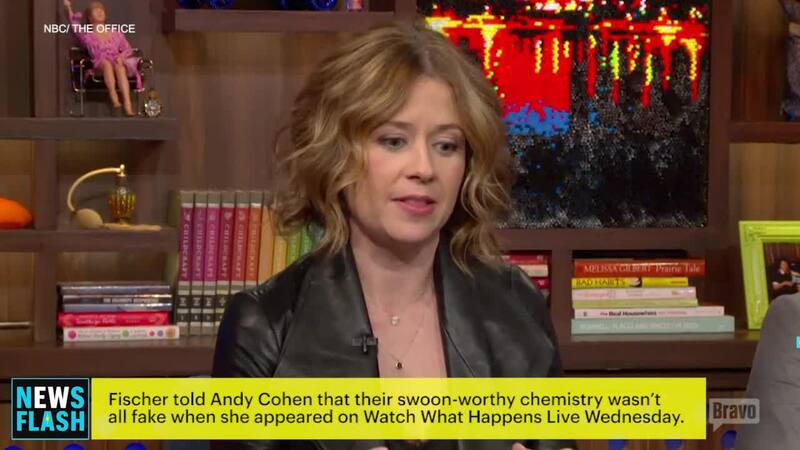 A few months ago, Jenna Fischer stopped by Andy Cohen's "Watch What Happens Live" and spoke about her relationship with John, saying that the two were "in love with each other," meaning their characters. John responded, knew it was taken out of context and then everyone had their hearts broken because they thought Jim and Pam were no longer friends. BUT WE NOW HAVE PROOF AND IT'S THE BEST THING EVER. For those who don't know, John Krasinski is currently staring in Public Theater's play "Dry Powder," alongside Hank Azaria and Claire Danes. Thanks to "rabid theater fan" Jenna Fischer, she copped a pic with her used to be beau and we just can't handle. Feel free to look at the pic for as long as you like. Check out more from John Krasinski in the gallery below! NEW YORK CITY, NY - DECEMBER 7: John Krasinski poses for a photo during a portrait session at the Ritz Carlton Hotel in New York City, New York on December 7, 2009. (Photo by Munawar Hosain/Fotos International/Getty Images) Reproduction by American tabloids is absolutely forbidden. Actor John Krasinski arrives at the 17th Annual Screen Actors Guild Awards held at The Shrine Auditorium on January 30, 2011 in Los Angeles, California.